Our free invoicing software Invoicebus got its first review. “Invoicebus is a newbie on small business software market. The web application helps make invoice templates, bill customers, email and download invoices, set payment alerts. After 45 days of promotional period and excellent feedback from our customers, Invoicebus introduced the fully functional premium plans. The forever free plan is called Mini-van and can store up to 3 clients. You can check the plans at https://invoicebus.com/pricing/. Skrill (Moneybookers) is respected payment processor from England, with more than 24 million members. Skrill was born as Moneybookers and plans to retire the name Moneybookers completely by the end of the summer 2012. More about Skrill can be seen on their official web: http://skrill.com. Recently we had our first update of Invoicebus. Insight of improvements and fixes are given in the following list. During the official test period we collected feedback from the first Invoicebus users. 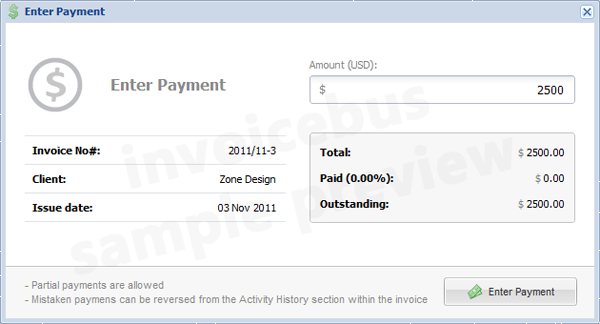 They gave great ideas and suggestions for improvement of Invoicebus, so we implemented some of those in this update. Better implementation of the trash. Go ahead, create free account and feel how fast your invoicing could be. November 30th, 2011 – 23:30min CET – The Invoicebus has finally arrived! Great thanks to all people who took part in the testing program and helped us tuning the final release version of the application. For those who have left feedback we prepared a few gifts. We are grateful to all friends and colleagues who supported us during the development process as well. You can register at https://invoicebus.com and use the free promo period for our premium plan called Single-decker. The promo ends at January 15th 2012. The Invoicebus Team wishes you a happy ride. Most of the invoice functions are translated for the quotes also. We will cover only the most common for both document types. The windows shown in the context below pop up when you choose some of the related actions. 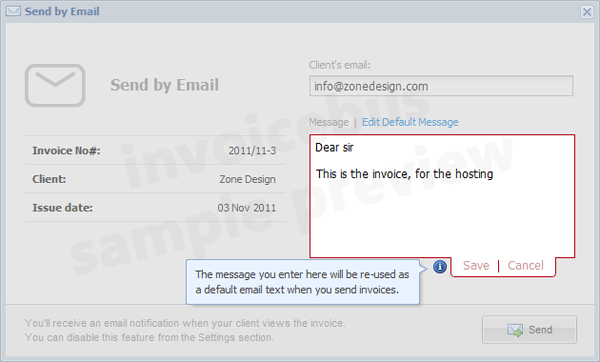 – Option that helps you to send an HTML version of your invoice/quote to the client’s email address. – Attach PDF option is included in case you wish to include PDF version. – You can enter custom text message to your recipient. The default message is edited from inside the same window. When you click Edit Default Message link, the text-box becomes modal, which means everything around it dims (becomes foggy), and the focus is brought only to the vital part; thereafter you can save your default message. Why to open the hood (read: settings) , when you can manage everything from inside the cabin (read: right here, where your focus and attention are). Intuitive, natural and fast just as blink of an eye. 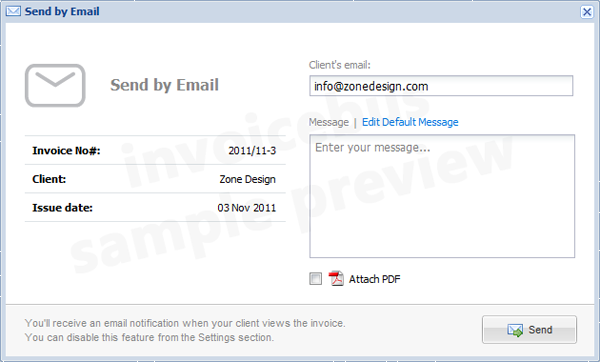 Notification will be sent to you when your client views the emailed invoice/quote for the first time. 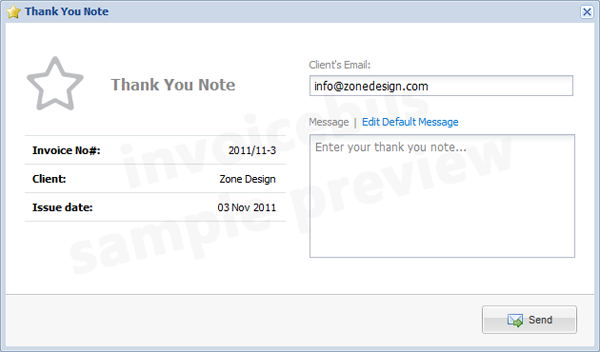 – After your client receives the quote, it will be able to accept or decline it directly from the email. Upon his decision you will get immediate email notification. Generate PDF file from your invoice/quote and download it to your computer. PDF version looks exactly the same as it’s shown in the invoice/quote view mode. – This option allows you to maintain your payment records. – If you enter smaller amount than the invoice total, it will be considered as a partial payment. – Notify your client when the invoice is overdue. Reminder contains your custom message and a few automatically generated details regarding the invoice. Good practice to show gratitude for your completed business deal is to send a tank you note which contains your custom message and a short details regarding the invoice. All actions taken for one particular invoice/quote are recorded in the Activity History section within that invoice/quote. We will talk more on this in the upcoming feature preview posts. Outgoing Invoices is a section within Invoicebus where you can do amazing operations with your invoices in a perfectly smooth and organized way. Why to manage numerous of data in different places and deal with complex customer relationship management modules when you can do all from one place, integrated and straightforward like an A.
Beside the total amount of an invoice, the total bar visually shows percentage of how much money has been paid to you for that particular invoice. It’s awesome when you run on visual for your partial payments, right? Tooltip is a little balloon-like box that appears when you move the mouse over the total bars and shows additional information. Dancing summary is created when filters are applied. What does that mean? As you apply/type filters, summary dynamically re-calculates (or dance) in real-time, depending on the matching results. You can combine multiple filters for more specific calculations. The list will display subset of invoices that match your filter criteria; therefore its totals summary will be calculated and shown beneath. Awesome! The Filters are mighty by themselves, but when you combine them with Sort, they become majestic. The picture shows descending sort for the total column. Can I apply more than one sort at a time? Example: First click the Total column, and then click Status. Sort priority will be: Status then Total. Neat stuff! Just on a tap of your fingers, with a few clicks and maybe a little bit of your creativity; possibilities of this invoice list probably extend beyond your imagination. Made from carefully chosen cotton, hand-tailored, printed with the original Invoicebus logo, these brand new t-shirts are our new symbolic uniforms. We are very happy to share how this little piece of garage working outfit looks like. We also introduced some behavior restrictions to amplify the concentration level and maximize our efficiency during working hours. For example, a person that wears Perl White shirt is not permitted to verbally disturb other person who wears Panther black shirt and vice versa. In this case, communication is only allowed via IM/Skype/Email even we are located in the same physical room. When all of us wear the same color shirt, verbal communication is permitted at any time. Here we will explain how your passwords are stored in the system and all about their security. For storing passwords Invoicebus uses something called one-way encryption with salted hash functions. Why is it called one way? Because it can not be decrypted ever, actually it’s not even an encryption. It’s a hash that is completely different thing. In fact, this is one way ticket algorithm for which there is no returning path. This is too awkward explanation of hashing and it might sounds like a rocket science, so with a couple of diagrams we will try to explain as simple as we can what it’s all about. This process happens every time you enter new password, you sign up, reset or change your password. Step 1: Generating random text called random salt, unique for every user. Step 2: Generating hash value from both your plain text password and the salt. The hashed salt will be stored in the database (DB) for validating the password in future (at login). Step 3: Generating hash value of the concatenated hashes from the previous step. 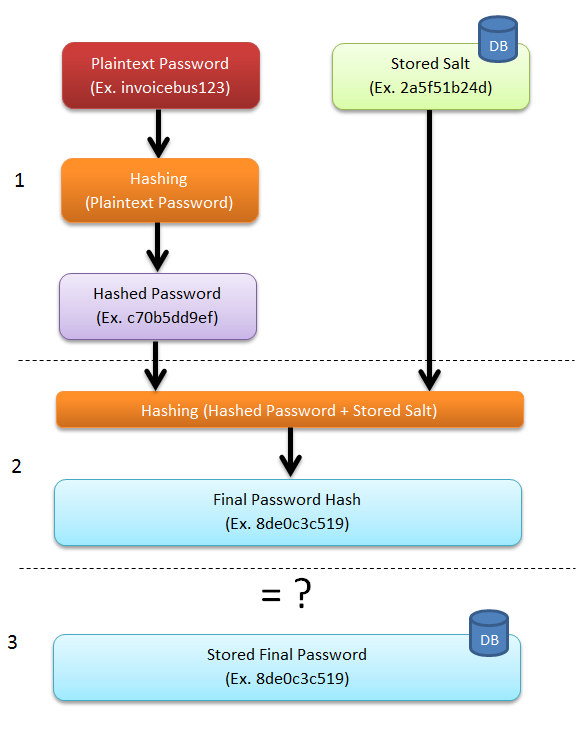 This is the final password hash that will be stored in the database (DB). The entered password is transformed to a binary value which looks like random gibberish, and nobody, absolutely nobody can retrieve the original plain text back, at least not with today’s technology. What if two users choose exactly the same password? Will their passwords be represented with same binary values in the database? – No! That’s what salt ensures, unique and hardened passwords, so every password is absolutely unique in the database. Even if you try to reset the old password by entering a new one that is exactly the same as the old password, its representation would be completely different in the database. Let see how the password is validated during the login process. Step 1: Generating hash value for your plain text password. Retrieving the stored salt form the database for that particular username. Step 2: Generating hash value of the concatenated values from the previous step. 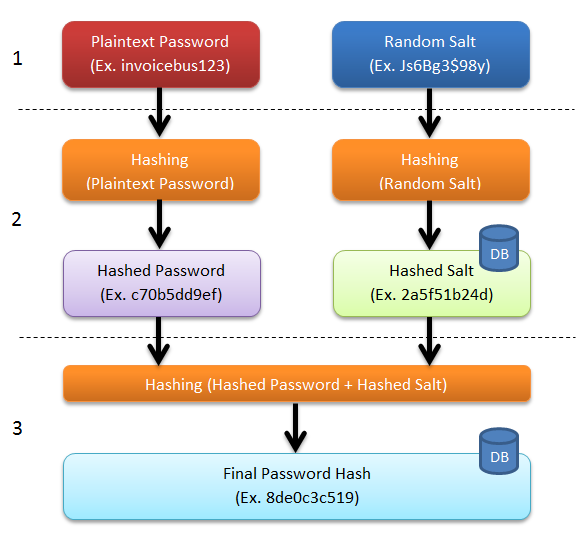 Step 3: Comparing the final hash password from the second step with the final password retrieved from the database. If they match the user is authenticated to access the system. If ever happen to forget your password, Invoicebus would be unable to retrieve it in its original plain text representation. That’s why an email is sent with a link where you can enter a new password. Be aware of online services that retrieve your password in plain text when you try to reset it. That indicates they don’t use hashing; probably they have some poor password encryption or don’t have an encryption at all. And even hashing is used, it’s a good advice to always choose unique and strong password for every online account you own. Because Invoicebus manages quite sensitive data concerning customer’s business, we would like to be clear as day when security aspect is on the menu. We are going to start this blog-post mini series with Data Transfer Security, the starting point where every security concern begins. The cool video bellow in less than 3 minutes, through an interesting story, explains the fundamentals of Secure Socket Layer (SSL) and a few other aspects behind Data Transfer Security.